Does your heart sink at the thought of putting together flat pack kitchen units? Don’t despair because we offer a flat packed range of kitchen units designed with both value and quality in mind. For those less confident DIY-ers, our range of carcasses are easy to assemble using the fitting guide supplied with each unit, although you could also consider made-to-measure, rigid kitchen units. Why Buy Flat Pack Kitchen Units? 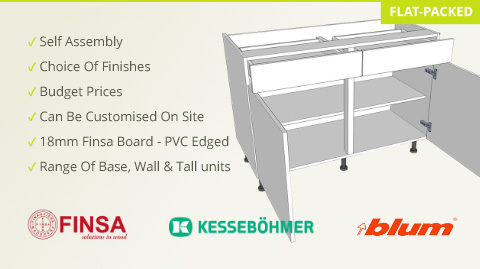 Our Flat Pack Kitchen Units are made from high quality FINSA MFC board with PVC edging and are 18mm thick. You can choose from a number of finished to match or entirely change the decor of your kitchen. Whether you're looking for kitchen base units, wall units, corner units or larder units, there are over 20 different sizes available. If you can't find the particular size you want, then you may be able to customise a standard unit to create a completely bespoke product for your kitchen. We can usually ship flat pack kitchen units faster than our range of rigid kitchen units, so if you need a kitchen in a hurry give us a call and we'll see what we can do. What’s the Right Thickness of Flat Pack Kitchen Units? All our kitchen units come in 18mm thicknesses. Typically, 15mm and 18mm are considered normal for kitchen cupboards, although some companies even offer kitchen cupboards that are a mere 12mm thick! However, as kitchen unit experts, we know how sturdy kitchen cabinets really need to be, so we only offer the thicker, more rigid 18mm option. Our flat pack kitchen units are actually the same thickness as furniture offered by even the most high profile suppliers in the UK. While you could get away with a 15mm thickness, the extra 3mm just give a bit of a buffer, ensuring that your kitchen units stay standing upright no matter what you throw at them and last for years to come.